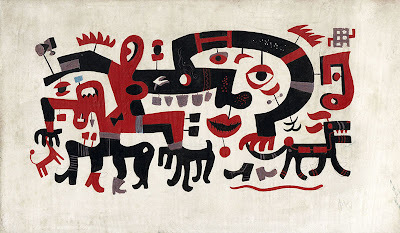 (Above) This work, depicting an inscrutable panorama of disconnected facial features, headless quadrupeds, and someone’s nightmare of a fanged horse, is casually referred to as White Block Quadrupeds to differentiate it from other untitled Flora works. The original was painted in tempera on a thick rectangular block of wood the artist had first swathed in a coat of white. 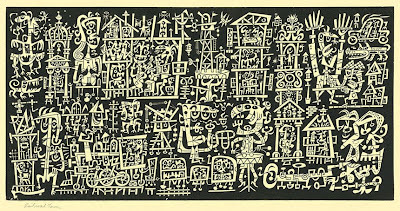 The stylized figures echo a number of motifs common to the artist’s work in the period 1942 to 1944, after he was hired by the Columbia Records art department. I JUST DISCOVERED THE ILLUSTRATION OF JIM FLORA. IT IS FABULOUS. When I saw the illustration (the first one in this list) I thought it was incredibly contemporary. Come to find out, the work of Jim Flora has inspired a new generation of top illustrators and artists. In case you have never heard of him and don’t know his life story, you will want to read this NY TIMES 2004 art review by BEN SISARIO. It is just too good (and thorough) not to repeat for you here. There’s a lot to read on the web about Jim Flora—but one site is pretty good and even sells prints by him. Read on, my friends. 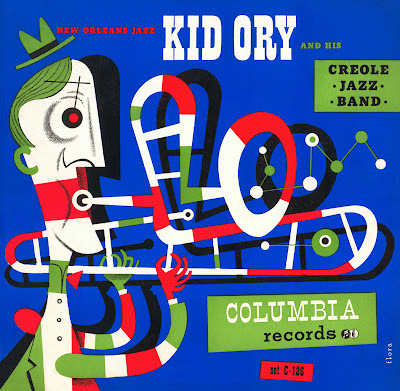 For many of the artists whose work decorates the jewel cases of today’s CD’s, a major influence is a man most have never heard of: an illustrator of record albums in the 1940’s and 50’s whose work can be found today in thrift shops and flea markets and hardly anyplace else. For this generation of artists and illustrators, Jim Flora is sort of an unknown creative granddaddy. 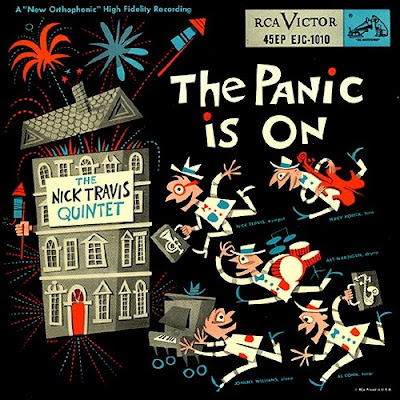 His atomic age album covers for Columbia and RCA featured grotesque yet comic Picasso-like figures rendered in a cartoonish, two-dimensional panic. 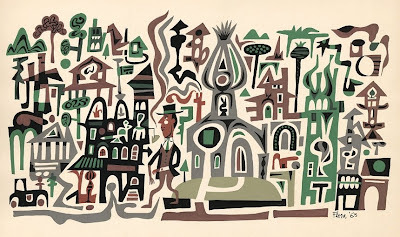 They set a standard of fresh design, bringing Surrealism and geometric abstractions reminiscent of those of Stuart Davis to commercial art and were widely imitated at the time. But by the 60’s, with the arrival of rock ’n’ roll and a new aesthetic, Flora’s covers ended up in the dustbin of discarded pop culture. And according to Irwin Chusid’s new book, The Mischievous Art of Jim Flora (Fantagraphics, $28.95), the dustbin is where numerous artists and pop-culture aficionados over the last several decades have encountered Flora’s work and discovered the origin of a style that has become irresistibly retro-chic. One fan, the California artist Shag, made a thrift-store find 17 years ago, “Inside Sauter-Finegan,” a 1954 jazz album on RCA. It has a devilish Flora illustration of two men joined like Siamese twins and dancing madly, with mouths like dinosaurs’ and what seems to be an X-ray panel over their midsections, revealing a riot of confetti, musical instruments and maybe some organs. Mr. Chusid, known to fans of musical scavengery as the chief force behind the rediscoveries of the music of Esquivel and Raymond Scott, and the author of “Songs in the Key of Z,” about outsider musicians, came across Flora’s work in much the same way. He found “Inside Sauter-Finegan” at a garage sale sometime in the 70’s and, like Shag, hung the record up without ever bothering to listen to it. Then in 1997, through illustrator friends, he found a group of Flora fans who had, with enterprising detective work, tracked down the artist to his home in Rowayton, Conn., and had begun pilgrimages there. Mr. Chusid began to collect Flora’s work, though there was no catalog and much of the original art had been lost or destroyed. Before Flora died in 1998 at 84, he gave Mr. Chusid a stash of his work. As Flora’s rescued reputation has spread, artists already steeped in the 90’s retro trend discovered a founding father. After years of being buried anonymously in the collective memory of design, Flora began to have a palpable effect on artists. 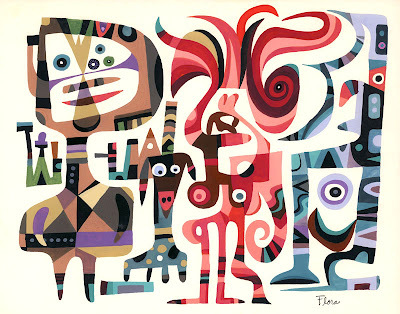 Flora’s designs are magically simple distillations of Cubism, Surrealism and cartoon madness, with playful figures and instruments floating in planes of color. 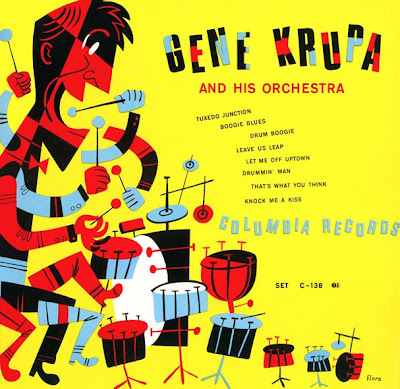 From the smiling Beatnik kitties on “Mambo for Cats” (RCA, 1955) to the five-armed, four-legged Cubist Gene Krupa bashing away with his mouth open on a Columbia cover from 1947, each figure seems to be on a childlike tear. Yet despite their apparent innocence, the images also have a jagged, volatile energy. Wow, what a great find! I know I've seen the work before, but never attached a name to it. It's like Stuart Davis meets Richard Scarry! GREAT. JUST GREAT. I remember sneering at mere "illustrators and commercial artists" years ago. Takes a big man to admit he was wrong. You are all right. Stuart Davis— probably a big influence. This guy—Jim Flora, living in obscurity until a younger generation hunted him down. Makes you wonder who is still out there. I know the next time I go through a bin of albums at an estate sale— my eye will be peeled for his work. It's like Dr. Seuss for adults. 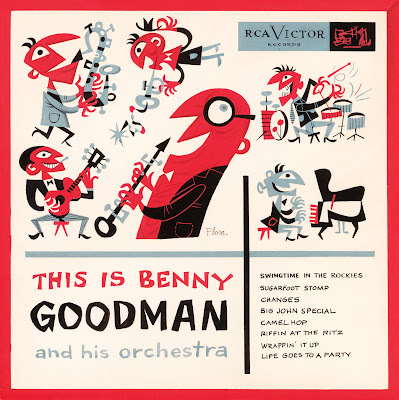 My parents had the Gene Krupa and Benny Goodman albums, as a budding young artist, I was fascinated by those covers, especially the multiple arms and legs Krupa had. Also loved the colors, another trip in the way-back machine! Very Interesting blog about photography, design, art, architecture, ephemera, found objects, pop culture, anonymous, outsider art, folk art, self-taught art, illustration, beauty, esoterica, auctions, discovery, art environments, mystery, vintage stuff and the magic that can be found in everyday things. One is that you should to wow gold create a bank alt, this also the basic of the leveling which will assist you with your Best WoW Gold Making Professions is critical at this stage of the game as you don't want to waste precious leveling time running back to the City to sell your stuff on the Auction House. Another things this simple that you should raise your character to level 5. With a good wow gold farming guide you will find the wow gold legal ways to make the wow gold fast and you will find that a wow gold farming guide is so important for us. Due to the nature of World of Warcraft whether you play as a Horde Player or an Alliance player you will find you need a lot of gold especially in the later levels when you will need a good steed. In the World of Warcraft there are so many spots to farm for gold, silver and bronze ,so there are plenty of World of Warcraft farming guides on the web and they will show you the best and quickest way to obtain vast wowgold amounts of gold in the shortest time possible. As Dr. Seuss for adults.